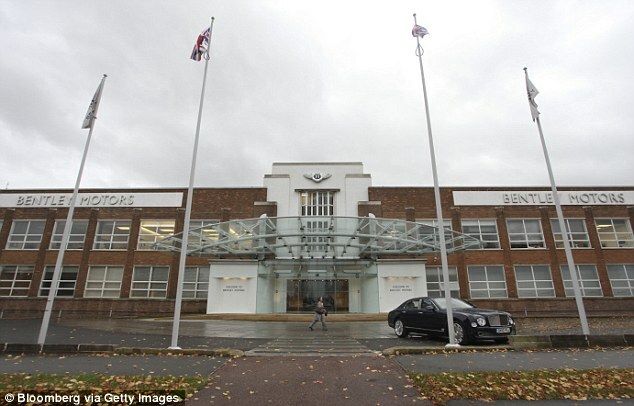 Bentley today announced more than 1,000 new jobs as part of a major £800million investment boost for the UK that will see a new £150,000 luxury 4X4 built in Britain rather than rival Bratislava. Prime Minister David Cameron was on hand at the Bentley factory in Crewe for the announcement which he hailed as ‘fantastic news’, a vote of confidence in Britain and another welcome sign of a healing UK economy. 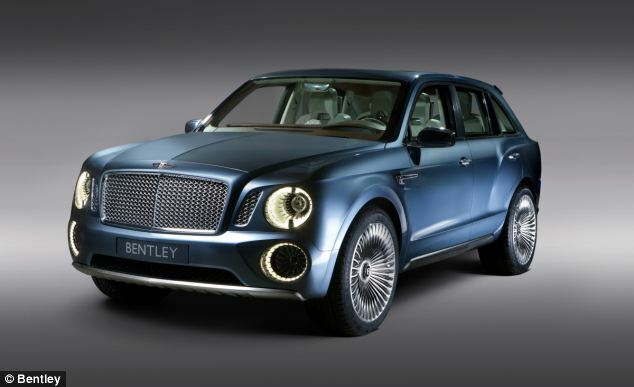 The new jobs and cash boost means Bentley will now build up to 4,000 a year of its first ever sports utility vehicle (SUV) at its factory in Crewe. It becomes the fourth model to roll off the line. It also marks a major boost for the existing 4,000-strong British work-force. Bentley, which is owned by Germany’s Volkswagen group, had been considering manufacturing the £150,000 4X4 in the Slovakian capital of Bratislava in Eastern Europe. The new 6.0-litre 185mph Bentley sports utility vehicle which accelerates from rest to 60mph in under four seconds is set to go on sale from 2016. 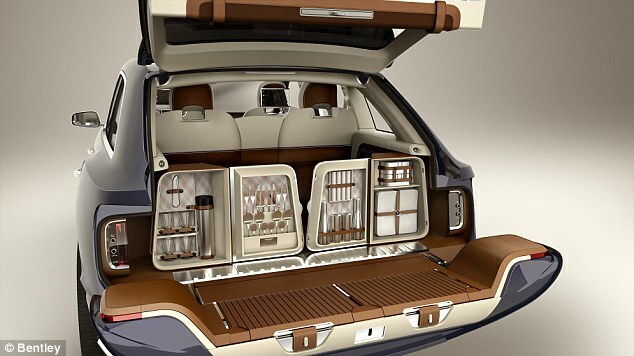 It will be a central plank in plans to double the luxury car-makes sales to 15,000 by 2018 – accounting for between a quarter and a third of all global sales. Sales were already up 22 per cent last year to 8,510. Prime Minister David Cameron who was at the Bentley factory for the announcement said: ‘This £800 million investment and a thousand new jobs from Bentley is fantastic news for both Crewe and for the UK as a whole. It is another important milestone in strengthening our economy. 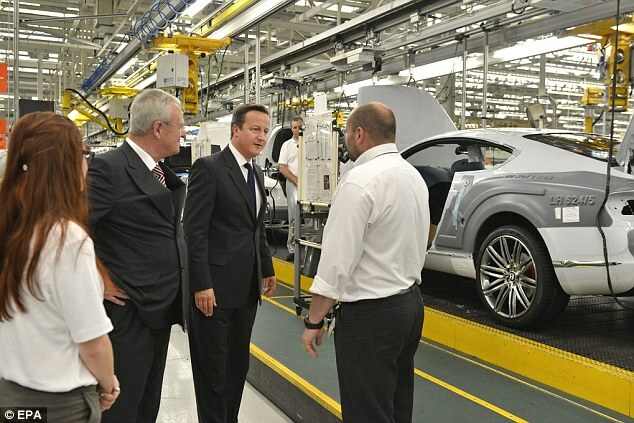 Business Secretary Vince Cable said: ‘This is a welcome commitment to the UK from a major international car maker. Our automotive industrial strategy proves this government’s commitment to working with world-class companies like Bentley to create jobs and promote exports. 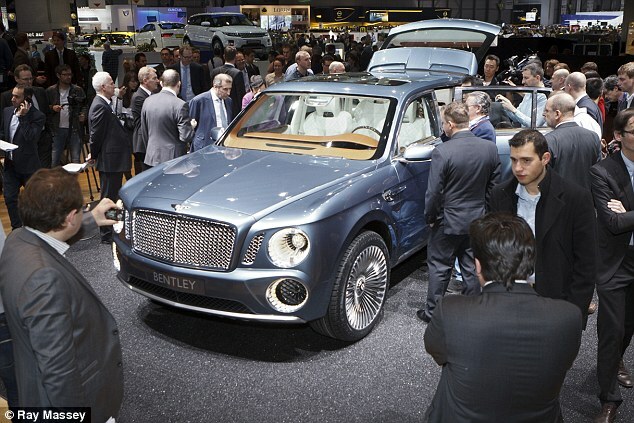 A Bentley spokesman said: ’The sports utility vehicle be a thoroughbred Bentley true to the brand hallmarks of luxury, performance, quality and craftsmanship. 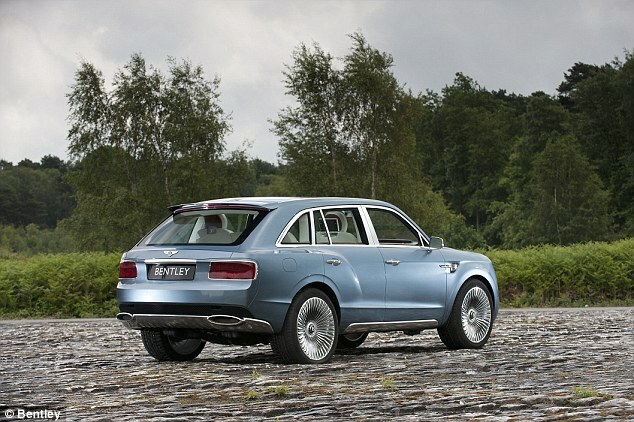 The styling will set it apart from any other SUV on the road and will be true to the Bentley design DNA. Prime Minister joins the Bentley Boys: (Left to right) Bentley chairman and chief executive Dr Wolfgang Schreiber, Prime Minister David Cameron, apprentice engineer James Bate, and chairman of the board of the Volkswagen Group Dr. Martin Winterkorn. The long-awaited decision in Britain’s favour means the plate that has adorned generations for Bentleys: ‘Made in Crewe, England’ will continue to resonate. Cheaper labour rates in Slovakia and uncertainty over whether Britain will remain in he European Union if there is a referendum were counting against the British case. But craftsmanship, a motivated’ British workforce, and the logistical cost of transporting parts between Britain and Slovakia were in its favour. There is plenty of room to build the new Bentley at Crewe and capacity was not an issue. However, it is understood that Crewe is also in line for subsidies worth up to £7million in tied to training and more jobs being created. Had the decision gone the other way it would have been the first volume -produced Bentley to be built outside of the UK in its near 100 year history since it was founded in 1919. It would have been built alongside other cars belonging to the Volkswagen Group such as the Porsche Cayenne, Audi Q7 and Volkswagen Touareg. Bentley did build some Flying Spur models in the Eastern German city of Dresden during 2005 and 2006 because of a shortage of capacity at Crewe. But series production of a major model would have been a bitter blow to traditionalists. Final styling of the new car has already been signed off and, following a significant facelift, will be very different from that shown on a much criticised ‘concept’ version which appeared at last year’s Geneva Motor Show. Bosses admitted afterwards there had been ‘room for improvement’ . The new model is expected to share the ‘face’ of the more familiar Bentley Continental. Potential buyers have already placed more than 2,000 pre-orders even before the final showroom styling of the car has been revealed. 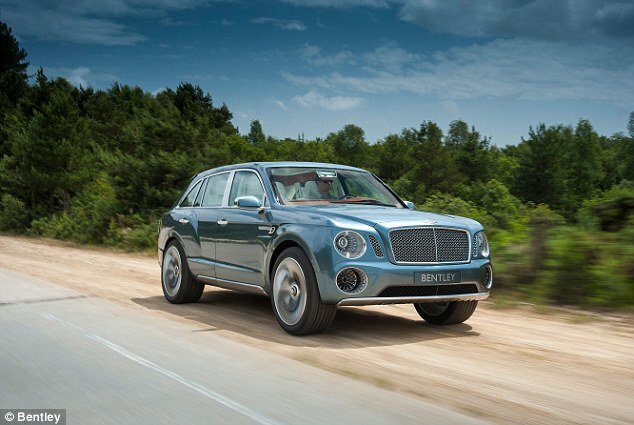 The new Bentley 4X4 will begin in price and prestige where the new rival Range Rover leaves off. About half of all sales will come from the United States and China followed by the Middle East, Russia and Europe. Some 87.3 per cent of Bentley’s cars are already exported. 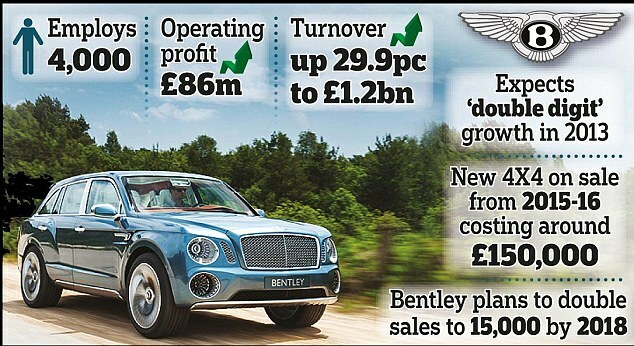 Booming Bentley has been a huge success story for Volkswagen. Operating profit is up from £6.85million to £86million, with turnover up 29.9 per cent to £1.2billion. It expects ‘double digit’ growth in 2013. Founded by Walter Owen ‘W.O’ Bentley 94 years ago, Bentley was bought in 1998 by Germany’s Volkswagen Group from Vickers PLC as part of a complicated three-way £430million deal in which their German rivals BMW took control of Rolls-Royce. The car industry in Britain has been enjoying a renaissance with massive investment and buoyant sales and profits by the likes of Jaguar Land Rover. It represents about 3 per cent of annual GDP, with a typical turnover of £55bn, and employs 700,000 people. Statistics from the Department for Business, Innovation and Skills, show a car, van, bus or truck rolls off a production line in the UK every 20 seconds. And four out of five of these vehicles are then exported. Earlier this month Jaguar Land Rover which employs 25,000 posted stellar results for the first half of 2013, with sales up 14 per cent on the same period last year. It shipped 210,190 vehicles to some 178 markets around the world. And the industry as a whole was this month given a £1billion shot in the arm to help develop the ‘vehicle of the future’. The Government and the automotive industry will invest £500million each over the next decade in a national engine development centre which is expected to create at least 30,000 jobs. Business Secretary Vince Cable said the Advanced Propulsion Centre will open next year to research, develop and commercialise the technologies for the vehicles of the future.